Moms everywhere have slowly begun to see how easy and planet friendly it is to use cloth diapers. I have been using cloth diapers on my children since 2004, and I am still delighted to see new brands and diapering innovations. Some of us cloth diapering moms are almost like kids in a candy store choosing the cutest print designs, the most luxurious organic velour inners, and alternating colored snaps. There is even a big market for used cloth diapers. Who knew diapering could be this much fun?! There is now even more fun in store since one of the biggest and most respected cloth diaper brands, bumGenius has just teamed up with another big favorite, BabyLegs! My youngest son is a fan of both products and has worn them since he was an infant. 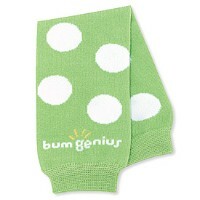 If you are familiar with bumGenius then you know they come in delightful pastel pinks, yellows, greens, and blues. Our personal favorite has always been the grasshopper green. BabyLegs is now offering baby leg warmers to match the bumGenius collection. They were custom-designed by Jennifer Labit of CottonBabies, and produced by mother-inventor, Nicole Donnelly, of BabyLegs. These two great companies have teamed up to offer us something new and special. It is a great cooperative effort to make diapering and dressing up baby even more fun. BabyLegs are made with a soft blend of 80% cotton, 15% polyester, and 5% spandex. bumGenius diapers are one size so they can adapt as your babies grows, eliminating the need for multiple size diapers. They come as pocket diapers or All-in-Ones (AIOs). You can also get bamboo fitted diapers. Photo Credit and purchase info: Kelly’s Closet. Gardasil is "Mostly" Safe, But Is It Effective? Killing the engine- is it car-less, or careless?